All the sites in this section offer free next-day delivery for some or all of their products - for all orders or sometimes for orders over a certain amount. You can filter these results by category using the 'Shops' dropdown menu above. Women's Clothing at New Look is a collection of affordable and trendy clothes at amazing prices. Shop online for this season's latest trends in Womens Dresses, Tops, Trousers, Jeans, Swimwear, Shirts, Footwear Jewellery and more. The 'Inspire' range has clothes in sizes 16 to 24. New Look now also sell Kidswear and Menswear. Currys PCWorld offers customers a vast range of over 3,000 products online including a constantly updated range of Web exclusives. From Washing Machines, Widescreen TVs to the Latest in Home Computing it caters for everyone. Currys PCWorld has a 24 Hr Helpline, delivery 7 days a week (usually within 4 working days of order) and expert installation, all backed by a nation-wide network of over 380 stores. B&Q offer a great range of Greenhouses all delivered to your home at no extra charge. Need more outdoor space? There is also free home delivery on selected Garden Sheds and Buildings. Also find lawnmowers, outdoor lighting and heating, tools, gates, fencing, garden furniture, play equipment, pots, bulbs, water features, gates, fences, decking and much, much more. Jessops online store - cameras, digital cameras, camcorders, accessories and more. A huge amount of photographic equipment. Also, upload and print your digital photos. 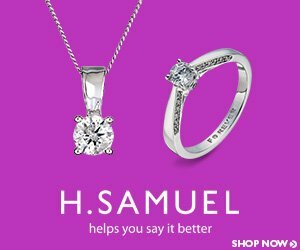 H.Samuel is firmly established as the UK's favourite high-street jeweller and you can now shop online. You'll find a great collection of fashionable and traditional diamonds, silver, platinum and gold jewellery, big-brand watches, stylish gifts and cute collectibles. With over 3,000 products to choose from, including H.Samuel exclusives, there's something to suit every occasion, taste and budget. Plus find buyers' guides, key seasonal trends and special offers online. Brilliant beauty bargains at Superdrug.com! Superdrug, great products, and great prices ... what more could you possibly want? Well, how about your own, personal Superdrug, open 24 hours a day, 7 days a week? Sound good, well guess what? It's already here at Superdrug.com. Cutting edge fashion to buy online from the high-street clothing shop. The Hut is a leading luxury online department store bringing you the very best from their breadth and depth of quality, luxury brands. They specialise in fashion, homeware, beauty, and lifestyle products. Whether you're looking to update your wardrobe, home, or even treat a loved one, they have something for everyone. Pay monthly and pre-pay phones. Choose from a selection of phones or keep your own phone and buy a sim card.